Is there a reader on your Christmas list who is fascinated with ancient Egypt? Nerfertiti was the wife of the iconoclastic pharaoh Akhenaten, best known for his monotheism. He worshiped the sun god Aten, to the exclusion of the many other Egyptian gods. 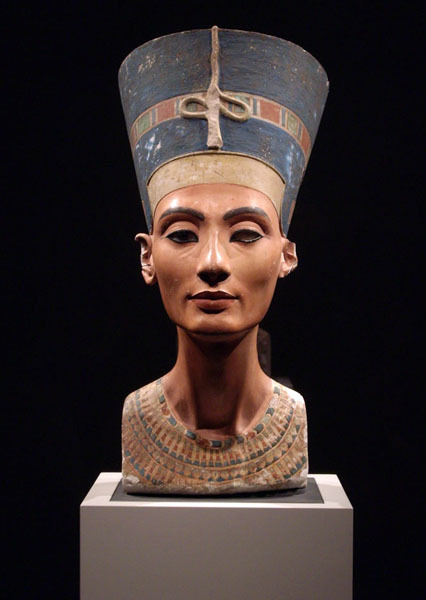 Nefertiti is popularly known for her great beauty, based on the bust pictured above. There is no question she was at the center of one of ancient Egypt’s most interesting periods. This is the story of Nefertari, queen of Ramesses II (the Great), who reigned for 66 years and is widely considered Egypt’s most powerful pharaoh and possibly the pharaoh, Moses’ adopted brother, who refused to set the Hebrew slaves free in the Exodus story. Ramesses II’s love and respect for Nefertari is exemplified in the temple he built for her at Abu Simbel. Not only is it one of the few temples built in the name of a queen but it’s the only known instance in ancient Egyptian art where a queen is portrayed equal in size to the pharaoh. Nefertari’s tomb is spectacular, the most beautiful of all the royal tombs discovered in Egypt. Cleopatra was the last pharaoh of Egypt, although she was actually Greek and didn’t even speak Egyptian. She was a member of the Ptolemaic Dynasty that ruled Egypt from the conquest of Alexander the Great to that of Rome. Cleopatra’s daughter, Cleopatra Selene II and her twin brother Alexander Helios were the products of Cleopatra’s affair with the Roman officer Mark Antony. This book tells the story of Cleopatra Selena II after the death of her parents, when she was taken to Rome by her parents’ rival, Octavian, the future Roman Emperor Augustus. This entry was posted in Egypt, Holidays & Festivals, Uncategorized and tagged abu simbel, Akhenaten, Alexander the Great, ancient egypt, ancient egyptian art, christmas list, cleopatra, Cleopatra Selene II, Egypt, Egyptian gods, Exodus, historical fiction, Michelle Moran, Moses, nefertari, nefertiti, page-turner, pharaoh, ptolemaic, ramesses II by yalla2013. Bookmark the permalink.